A coming of age adolescent story about young Alejandro, an orphan street-wise hustler who is trying to make a better life for he and his seventeen year old sister. Alejandro lives and works in a autobody shop outside of Queens with Shea Stadium and junkyards sprawling in the background of his neighborhood. Within these slums, Alejandro is thrown into a adult world that has him struggling to make heads or tails of his place in the world and to survive each new day. 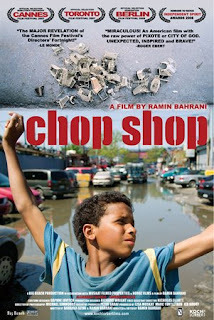 Winner of the 2008, Someone to Watch Award, Chop Shop is written and directed by Ramin Bahrani and is a wonderful narrative tale of the struggling life of Alejandro and his sister Isamar. This film completely carries itself on the narration of Alejandro and the gripping cinematogrophy of the outskirts of Queens in New York. The film is dialogue and character driven and has sluggish pace even in the very short 84 minute running time. Regardless of the sluggish pace, Chop Shop is a poignant look into the dim reality of a young boy and his sister living alone in the harsh streets of Queens. Alejandro Polanco is absolutely riveting as the young street orphan Ale. He carries this film throughout and does a tremendous job handling the lead role. His dialogue is perfectly delivered and he feels no where near as young as he is on screen. As the film would have us believe, Ale feels like an adult in a child's body. He handles himself like an adult in every respect, except his education. Ale throughout the film is quick tongued and very strong willed. Polanco delivers a meaningful performance in making every aspect of Ale's characteristics well-rounded and ultimately very moving. The rest of the cast is highlighted by Ale's sister Isamar, played by Isamar Gonzales. Isamar does not play a typical older sister to Ale. She has been out of his life as the film opens and comes to live with him in a local autobody repair shop. Ale has found her a job in a local taco truck and she is less than enthusiastic for his help. Isamar does a good job of playing a teen who is placed in a rough situtation and trying to struggle her way out. Isamar's and Ale's dialogue and relationship as brother and sister is pivotal to the story and helps to give the viewer a complete picture of this chaotic life they live. The films location does play a major role in showing the plight of the two siblings. If it were not for the imagery of Shea Stadium, home to the National League Mets in baseball and the "L" trains passing by, one could almost see the setting of the film in Africa or South America. Seeing these locations and the realism of the struggles that young Ale and his sister Isamar are thrown into give the viewer insight into their own situation. Chop Shop opens our eyes to what the life of a hustling street orphan is like and shows us how to find optimism even in some of the most gloomiest situtations. Ultimately, Chop Chop is a eye-opening look into the life and hard decisions young adolecents must make when forced to live on their own in the rough streets of Queens New York. The cinematogrophy and background are amazing and really set the tone of the hope enducing film. Alejandro and Isamar are both very strong in their roles and do an amazing job carrying the message home in this short and thought provoking tale of the slums on NYC. The narration delivered throughout is well written and well delivered by young Ale and really keeps the viewer locked into the chaotic story. Overall, Chop Shop is a well rounded indie film that tells a touching story in a real simple way. Through real emotion and real struggle, and with a gripping backdrop to tie it all together. Pixar's UP Teaser Trailer Soars! Trek Fashion True to Original Series! Beverly Hills Cop 4 has its Writers! Inglorious News for Pitt & Universal!! Ghostbusters 3, Ramis & Apatow Teamup!?!?! Please God, No!! Angelina Wants Catwoman Role! Punisher: War Zone One Sheet & RedBand Trailer!! Best Thing at Comic Con 08!! Image Gallery 2008 Comic Con!! Review - When Did You Last See Your Father? Cruise & Top Gun 2? Dark Knight Breaks the Box Office!! New Terminator and Friday the 13th Pics!!! Diablo Cody in Spielberg's Dreams? Theroux is Writing Iron Man 2!! Jet Li Mummy Pic Released!!! Two Cool New Clone Wars Posters!!! Michael Bay Talks Friday the 13th remake!! QT and Brad meet for Inglorious Bastards!! Full Trailer for The Spirit Leaked!! !